With absolute control and accuracy in mind, Cheyenne has introduced the biggest innovation in the tattoo industry – the Cheyenne Hawk Pen. 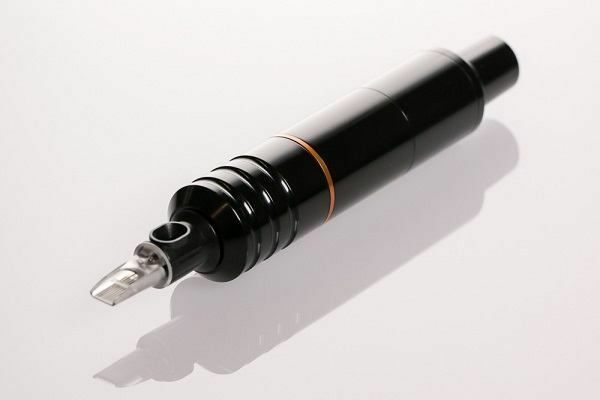 This revolutionary machine is specially designed to closely resemble an actual pen, which will facilitate even more precise tattoo procedures than before. The Cheyenne Hawk Pen is compatible with its own 21mm and 25mm grip, the Cheyenne cartridge system, the PU I and PU II power supplies, and Cheyenne Thunder and Spirit power cables. Other power supply brands can be used with the Hawk Pen, but will need an adapter cable depending on your particular power supply (red/black plugs). This machine does not need a start-up facility. The Cheyenne Hawk Pen is available in six colors – Black, Bronze, Orange, Purple, Red, and Silver. This listing is for the Cheyenne Hawk Pen in Black. Included with your Cheyenne Hawk Pen purchase are a 25mm grip, connection cable, pen tray, phono plug cord and instruction manual. Please Note: The Cheyenne Hawk Pen is a completely new machine with new grips. Other Cheyenne grips are not compatible with the Hawk Pen. Your Cheyenne Hawk Pen is covered under manufacturer's warranty for up to two years from the delivered date. We do not accept returns, issue exchanges, or make repairs on Cheyenne Hawk machines; more details can be found here. If you experience any issues, please contact support@painfulpleasures.com immediately.